You are invited to join Oak Hill Farm owner Anne Teller for a guided walking tour of her sustainably-farmed fields of flowers, vegetables and and fruit orchards on Saturday, October 1st from 10:30AM -1PM. Oak Hill, a 25-acre farm at the foot of the Mayacamas and known to many by its distinctive Red Barn Store, is one of Sonoma Valley’s treasures. 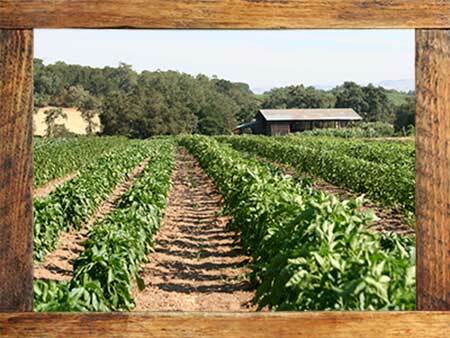 The Teller family has practiced sustainable agriculture for more than 50 years and harvests 200-plus varieties of organically-grown vegetables, fruits, flowers and herbs as they naturally come into season. The farm is part of a larger, 700-acre property held in perpetuity as protected wildlands. Anne will be delighted to talk with us about the Tellers’ commitment to sustainable farming and to stewarding Oak Hill’s incredible natural resources. This is an easy, flat walk of about two miles round-trip. Afterwards we will enjoy a discussion with a light lunch and wine. The walk is limited to 40 people and reservations are required. A donation of $45 will secure your space. All proceeds go toward upkeep of Sonoma Overlook Trail. The public trail is managed on an all-volunteer basis by a group of Sonomans who donate their time to keep the trail in good repair, protect natural habitat, assist visitors and lead hikes. To learn more about Oak Hill farm, please visit oakhillfarm.net. 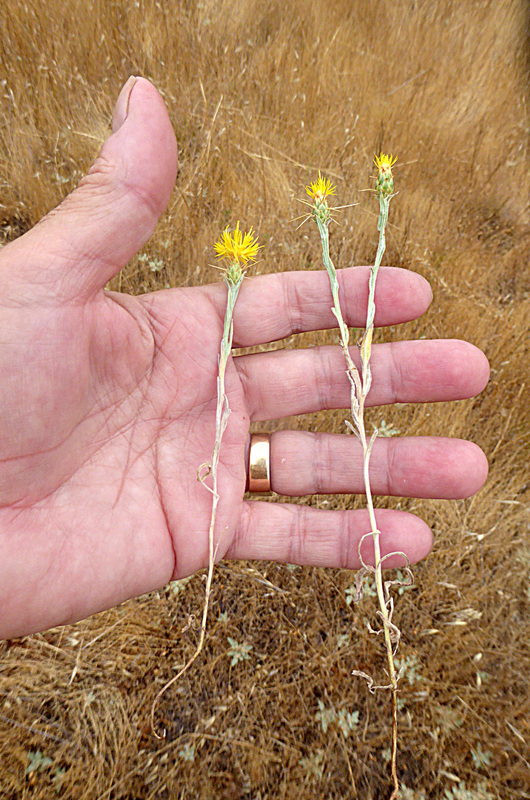 Faithful readers of this blog (all two of you, and one is my Mom) will know that we’ve been fighting the good fight against the invasive non-native Yellow Star Thistle on both the Overlook and Montini properties. The season for pulling it runs from mid-May to August. Now that we are in August, when the weed dries out and the seed heads drop off, we must quit. But I’m here to tell you that we are winning the war. This is the second year that I can certify that all of the infestations on the main properties of both the Overlook and the Montini have been essentially cleared. Judging from the number and size of the plants we are pulling in most areas (see the small plants pictured), we are depleting the seed bank, which can be viable for up to five years. We could not have reached this point without essential assistance from Rich Gibson, a biologist and a Sonoma Overlook Trail volunteer steward, and the Sonoma Ecology Center’s EnviroLeaders program. Twice, at least half-a-dozen teenagers from the EnviroLeaders Program came out and helped decimate the worst patches of Yellow Star Thistle on the Montini Preserve. Tony Passantino, the SEC’s EnviroLeader’s program manager, has been very willing to bring his team out to support our removal efforts whenever we called for help. And the teenagers who are a part of this program are willing hard workers and ready to learn about the environment and how to keep it great. We so appreciate their help. Next season expect a call to go out for help in decimating this scourge. And if you see it, please consider helping. The situation gets better every year, but we are still years away from eradicating it completely. We can use your help to make YST only a memory on these properties. So begins “The California Naturalist Handbook,” the standard textbook for a rigorous UC-approved course designed to turn local nature lovers into trained California Naturalists. These knowledge keepers act as park docents and as key leaders in the “citizen science” movement helping to shape California’s future. Right now, Sonoma Ecology Center is teaming up with the University of California Division of Agriculture and Natural Resources to offer this accredited eight-week course locally – and we’re looking throughout Sonoma and Napa counties for people interested in joining the elite and venerable league of California Naturalists. The course results in real college credits – but even better, it turns nature lovers into certified graduates of the UC California Naturalist Program, making them valuable authorities on California’s plants and animals, geology and soils, water, climate, biodiversity and much more. California Naturalist courses are available at certain locations throughout the state, but this is the first time such a course will be offered at Sugarloaf Ridge State Park. The course, held Monday evenings from 6 to 8:30 p.m., will run from Sept. 19 to Nov. 19 at Sugarloaf Park’s Robert Ferguson Observatory. Speakers will include professors from local colleges and universities and experts from Cal Academy and the Sonoma Ecology Center. The course also will include four five-hour fieldtrips (Oct. 8th, 22 and Nov. 12, 19) lead by field experts in and around Sugarloaf Ridge State Park. As their final project for the program, each naturalist-in-training will complete an eight-hour volunteer service learning project for a community organization. Participants of this course will graduate with a specialized knowledge of the oak woodlands indigenous to the Mayacamas Mountains. To sign up for the first-ever Fall 2016 California Naturalist Program at Sugarloaf Ridge State Park, go to www.brownpapertickets.com/event/2586749. For more information, call or write Tony Passantino at 707-996-0712 ext. 124 or tony@sonomaecologycenter.org. The course costs $370 (or $399 after Aug. 19) and is limited to 25 participants. Limited scholarships are available on a case-by-case basis. Those able to do so are encouraged to print out and post our flier for the event! A pdf copy of the flier is available by clicking the link below.